Unless systems are renovated, human resources and costs will be wasted to take care of existing systems, and an economic loss will possibly be up to 12 trillion yen in all over Japan per year after 2025. This shocking prediction, called the "2025 cliff," was raised in the "DX Report" by the Ministry of Economy, Trade and Industry in 2018. According to the report, the greatest obstacle to digital transformation (DX) in Japanese companies is existing aging systems. The complicated and black-box internal structure of existing systems is preventing the leveraging of data across companies, and the maintenance and management of these systems forces many companies to cost both in terms of personnel and monetary expenditures. Due to factors such as the shrinking labor pool, this is coming to be recognized as a societal problem. Toshiba Digital Solutions combines advanced digital technology with "IT modernization" technologies for optimized application to existing systems in its "CommonStyle" fundamental technologies for system development. CommonStyle systematizes the methodologies and components for efficiency improvement and standardization developed through the years by Toshiba Group. Let's look at the background and ideals of IT modernization and our latest efforts to further enhance CommonStyle. Digital technologies are used to provide the services needed in management and operation workplaces in a timely fashion. The goal of DX is to realize innovative process transformation that makes it possible to flexibly and quickly respond to the societal and business changes resulting from these digital technologies, and to create new business, thereby increasing corporate value. This means the replacement of numerous processes with software. The greater the advance of DX, the larger the number of development areas. Advanced digital technologies such as the Internet of Things (IoT) and artificial intelligence (AI) will be applied to existing systems, without slowing the operation efficiency improvements that are already underway, through a cycle of trial and error. Disruptive innovation (digital disruption) is already being implemented by newcomers that use digital technologies to roll out new business models in various existing industrial fields. What changes will occur if this disruptive innovation changes the criteria for judging information systems from "do they operate stably" to "do they contribute to the rapid launching of services and the creation of corporate value?" Companies are reappraising the value of conventional system integrators, who perform development work on consignment, seeking to reduce costs and optimally secure resources. At the same time, it is easy to imagine the growth of the philosophy, rooted in worksites, that "what we are truly called on to do is that which only we are capable of doing." The growth of Open Source Software (OSS) and public clouds, which dramatically increase the productivity of system creation and operation, will further encourage this movement. We are starting to see companies that work with platformers, or use the technologies and services they provide, to transform their internal systems without relying on vendors. However, accomplishing this requires several challenges be overcome. There is a risk that the existing systems that serve as the platforms for future DX will become a hindrance to DX transformation. QCD* has been the highest priority in existing systems. Over the years, they have undergone successive changes, and had various functions added to them. As a result, there has been a rise in the number of systems whose complexity makes it impossible to take them all in, becoming black boxes. The tremendous amounts of customer information and operation data stored in systems are valuable assets that can be used to transform business. When customers themselves can securely manage this data and leverage it effectively, it contributes to their ability to implement valuable DX. However, the funds available for investment in new ideas and approaches are limited, and implementing reforms while at the same time maintaining stable operation of these black box systems presents a major challenge. Click here to move to the top of this page. What are the conditions of IT modernization? Attention is now being turned to IT modernization as a way of tackling these issues. Existing systems, which have become increasingly complex, turning into black boxes, are being rebuilt, leveraging their features and assets while adapting to the latest digital technologies and changes in the business arena. The goal is to balance offensive and defensive IT and produce innovation. 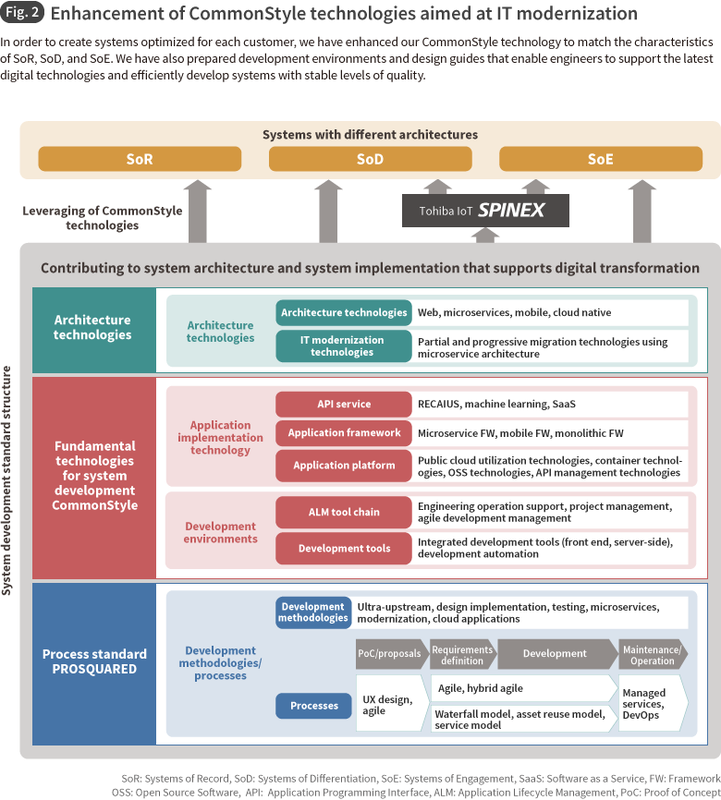 A key part of IT modernization is that, while it requires extensive SI experience and results in a broad range of industrial fields, it also requires all-around technical strengths for turning system ideals into actual real-world systems, such as the ability to develop systems that support the latest digital technologies. Toshiba Digital Solutions has built up extensive knowledge and technologies for large-scale, stable and safe systems through supporting development and operation of Toshiba Group's business in the energy, social infrastructure, factory manufacturing, civil service and government fields, as well as in-house enterprise systems. We have also focused on advanced digital technologies such as AI and the IoT, offering products such as Toshiba's "SPINEX" IoT, "RECAIUS" communication AI, and "SATLYS" analytics AI, building up a steady track record. We have defined the following three IT modernization requirements for alleviating DX implementation risks and accelerating DX, and used our extensive know-how to meet them. Led by our philosophy of thoroughly meeting these requirements and continually improving systems, we have implemented various measures for progressively and continuously advancing systems. The keys to these efforts have been CommonStyle technologies we provide and the members of our System Engineering and Technology Center, which provides robust support to the business and product development divisions that are actually developing services and systems for various industrial fields, and which accrues experience and expertise for further use in the future. The Systems Engineering and Technology Center supports the engineers of the Toshiba Group, performing research and development aimed at providing high quality services and systems efficiently at optimal costs. It turns the fundamental research performed by Toshiba's Corporate Research & Development Center and Corporate Software Engineering and Technology Center into practical production technologies. It makes out guidelines for the creation of optimal systems for individual projects and for the effective use of tools. It also combines its own research and development work and pilot operations involving new technologies, OSS combinations, and the like, together with its accumulated knowledge, to create system development standards. The first standard is the "PROSQUARED" process standard, which comprehensively defines operations from service and system planning to development, operation and maintenance. It is served as the development methodology and process standard through combining Japanese and foreign specifications and industry standards with various methodologies, such as the UX design*, agile and waterfall methodologies we have used in our past development work, and the know-how we have accrued through our work on conventional SI system development, cloud utilization and IoT projects. Engineers select and apply the standards based on the features of individual development projects. We are also actively working to develop advanced architecture technologies, such as cloud native and mobile first applications and the use of microservices, and practical technologies for IT modernization, such as those used in the partial or progressive migration of existing services and systems. We go onsite in development sites, working with business divisions to accrue experience through implementation and testing, developing practical common platforms. A vital part of our system development standard structure is the "CommonStyle" we began in 2006. It standardizes system development know-how and systematizes application implementation technologies and development environments. The application implementation technology provides application programming interface (API) services, application frameworks, and application platform technologies. At the same time, it clearly stipulates how these are to be combined, making asset reuse easy and supporting the building in of high levels of quality. For development environments, it provides application lifecycle management (ALM) tool chains and development tools that support advanced application development, helping make it possible for engineers to smoothly deploy leading technologies and improve work efficiency and quality. The Systems Engineering and Technology Center has been at the forefront of employing IoT technologies, agile development technologies and OSS utilization technologies in CommonStyle, working to further enhance the fundamental technologies. It has also extended CommonStyle to include not only public clouds, Platform as a Service (PaaS) and Software as a Service (SaaS) -- technologies used to perform IT modernization – but also microservice architecture*, which combines multiple small services developed using function units called microservices and provides them as single services or systems. * Microservice architecture is introduced in detail in #02. In our development of technologies for flexible and fast optimal IT modernization of rapidly changing business environments, we have noted the expectations customers have for systems. In order to create the systems perfect for customers, we have enhanced CommonStyle for Systems of Record (SoR), Systems of Differentiation (SoD), and System of Engagement (SoE). For SoR, it revamps existing systems, efficiently improving their functionality and stabilizing their quality. This can be achieved with conventional CommonStyle as well, but our aim is to further support engineering operations for the engineers that develop systems, such as by automating the quality checking of specification designs, to more efficiently stabilize quality. For SoD, on the other hand, it leverages existing systems, using advanced digital technologies to provide greater added value. 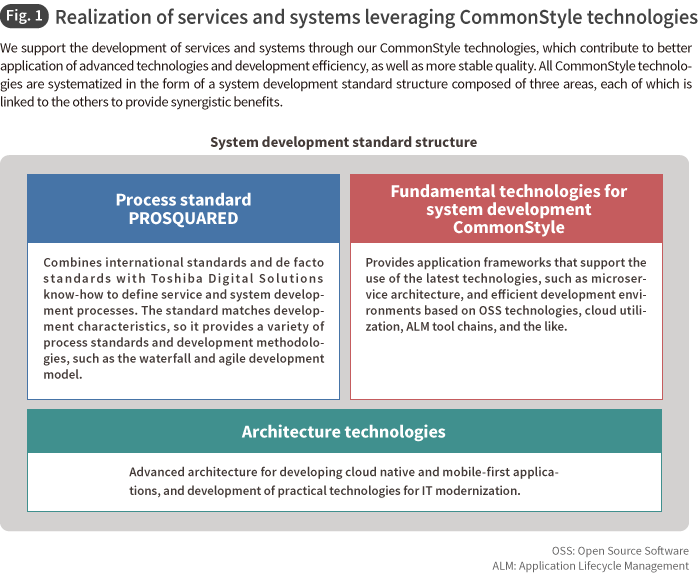 In order to enable customers to preserve differentiation and competitive superiority in line with their needs and business environments, CommonStyle also includes, in addition to OSS, technologies and design guides for evolving systems by fusing them with advanced digital technologies such as public clouds and microservice architecture. While sharing visions for required systems with customers and the business departments that develop solutions, it establishes production technologies for flexibly adding new technologies to existing systems while maintaining a stable level of quality. For SoE, it uses advanced digital technologies such as AI and the IoT to create competitive services with the aim of realizing DX that provides customers with real value. Ideally, development environments should be user-like development environments in which, even after services are released, problems are corrected, systems are adjusted and updates are made based on current conditions. The Systems Engineering and Technology Center has prepared a new implementation technology for CommonStyle that can be commonly used for any platform, such as on-premise or cloud platforms. It has prepared development environments and guides for using this platform to rapidly create microservices and link them with the data in existing systems via API (Fig. 2). By enhancing these development environments and guides, CommonStyle makes sound system operation possible through API for easily looking up necessary data, support for robust architecture and advanced digital technologies that can handle changing business and social environments. Furthermore, it supports work automation for maintaining systems through appropriate monitoring and resilient design for new systems, as well as the deployment of DevOps, in which operation staff cooperate with system development team to make ongoing system improvements. CommonStyle has grown into a part of next generation system development standard that fully leverages our experience with the three requirements of IT modernization for accelerating DX. We are using these technical strengths to their fullest to overhaul systems into ones which are resilient in the face of change and make it possible to freely use the data from existing customer workplace systems. 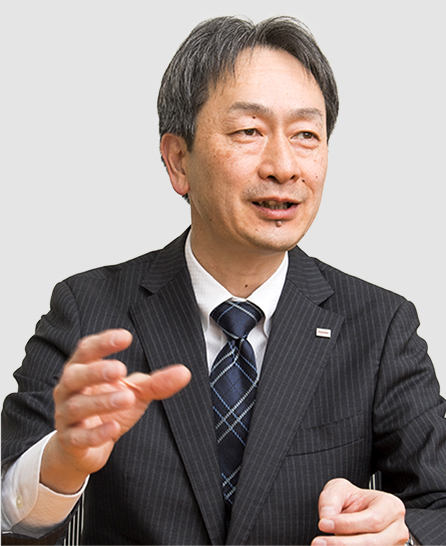 Toshiba Digital Solutions will continue to evolve as a partner that works hand-in-hand with partners to take on the challenges of IT modernization, overcome the "2025 cliff," and create valuable DX. * The corporate names, organization names, job titles and other names and titles appearing in this article are those as of January 2019.